Introducing a wide range of Evetech products built around Intel’s latest and most anticipated processor release – the 8th Generation Intel Core i7 CPU! From custom builds and standalone processors, to carefully crafted upgrade kits, Evetech ensures that your switch to the newest technology remains a seamless experience. 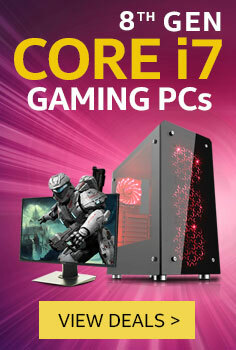 Our Core i7 Gaming PCs are created with the sole aim of helping you decimate your opponents. Whether you want to play at the highest of resolutions and turn up the graphic details to enhance your immersion, or play on high refresh rate monitors and want to push your CPU to the limit so it can provide a high fps gaming platform – the 8th Gen Core i7 Gaming PC range has you covered! 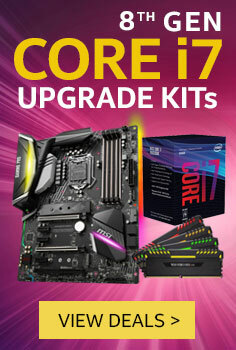 Our upgrade kits make sure that you’re not scrambling for the right/compatible hardware. They are carefully selected to make your upgrade to the 8th Generation Intel Core i7 one of the easiest things you have ever done! Enjoy a seamless transition to a powerful computing experience – in the blink of an eye. Come. Explore our range of products built around the powerful next-generation Coffee Lake Intel 8th Generation Core i7 processors! However, if you’re still contemplating this upgrade, here are the top 5 reasons to grab Intel’s latest 8th Gen Core i7 processor right now! Two More Cores. Four More Threads. Leaving behind quad-core Core i7 CPUs, Intel has upped its game by adding two additional high-performance cores to its 8th Generation Core i7 processors. This allows for much faster computing, multitasking, while drastically reducing the time it takes to get through processor-intensive tasks. 50% performance improvement over last generation alone. Remember the no-brainer statement above? A whopping 50% increase in compute performance over its not-so-old Skylake 7th Generation processors is plenty of reason to upgrade. The 8th Generation Core i7 blows even Intel’s previous offerings out of the water. Improvement in single-core performance. Intel is already considered the unbeatable champion of single-core processing. However, these Core i7 processors bring up to 15% improvement over the last generation – speeding up games and applications that rely on a single or fewer cores by a healthy margin. The processors that beat the best gaming processors on the market are here. Future-proof. The 6 physical cores and 12 threads grant enough headroom to ensure that your CPU will last for a long time. It will be able to keep up with the most demanding of games released over the years. Since this is a significant jump over the 4-core CPUs of the past, it will certainly be among the best processors for a while. Most powerful Gaming CPUs in the world. 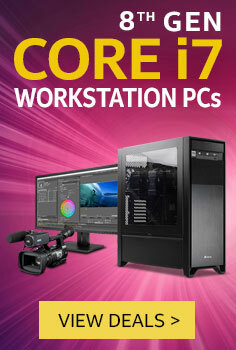 These 8th Generation Core i7 processors can deliver blistering high frame rates that competitors just can’t. In fact, so high that even Intel’s older processors don’t come close to them! If you’re a gamer who thrives on high framerates and enjoys a fluid performance in all games, one of these Core i7 CPUs should be powering your Gaming PC. 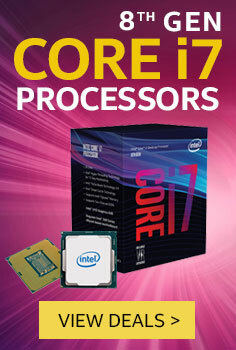 The 8th Generation Intel Core i7 Processors are built for reliable single and multi-core performance. After all, why compromise on one for the other when you can have both with Intel? Get yours today!